Very happy a couple of days ago. A frog has decided to lay her eggs in the lilly jar by our front door. 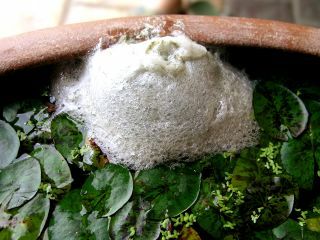 These bubbles have a very hard, plasticy skin protecting the eggs that are laid above the water. When the eggs hatch, in a couple of weeks, the tadpoles will eat their way out of their protective coating and fall into the water, where they will hopefullly grow to maturity.